Discussion in 'Game Programming' started by XXxxImmortalxxXX, Jul 3, 2008. When I started game programming I had all the enthusiasm but lacked quality information on how to go about actually making a complete game. There is a definite lack of complete game programming tutorials. Much of my time was spent flicking from one webpage to another not finding anything particularly useful. So I’ve decided to write a tutorial for your benefit so by the end you will be able to have a complete game under your belt. A perfect game to start off with, in my opinion, is Pong. This project will use VC++ and OpenGL for the examples. 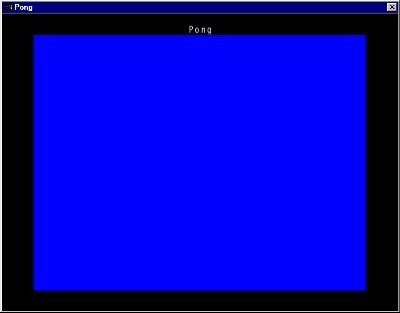 Pong is no different. With these in mind we shall structure our Game_Main function around this. The GETREADY state will be a state when the player's have a chance to get ready when the ball is reset after a goal or a new game is started. We will make use of the OO technology we should look at what objects the game will use. The advantages of using OO to encapsulate the objects will makes things a great deal more organised. Practicing these methods now will pay off when you have a large project, you wont have to wade through so much code to make modifications. Each of these we will create a class for and fill in as we progress. With most of my projects I like to get something happening on the screen so I can test things as I go. For this project I think a good place to start would be to get the board drawn on the screen. Just a simple rectangle will do for now. We can modify and add to it as we go. We’ll create a new class CBoard to do this. This class will need to have attributes and functions added to operate in our game world. Pretty simple. The color array is just an RGB (red, green, blue) set for the board. We may add some attributes later, such as a texture for the board. We’ll set the width/height and color attributes in the class constructor. We need to include the class definition in main.cpp, and for such a simple game we will declare the objects as globals and refer to them in our main.cpp functions. Adding a couple of lines to the Game_Main() function to call the board class' Draw() function and we get something happening. The ball is probally the most complex object we will have in our game, it is also the most interesting! Our ball will need a few attributes. We need to keep track of it's position which we'll use x,y,z for. It also has a radius and a color similar to the board. The ball has a speed vector [xi, yi, zi] which represents the relative movement of the ball. It will be used to update the ball position and direction. We shall talk more about this later. To draw the ball in OpenGL we’ll get tricky and use a quadric. It sounds pretty in depth but it's just an easy way to draw a 3D sphere. The line attribute GLUquadricObj *sphere is a pointer to the quadric that we'll use to create and draw it. It’s pretty simple to use, check out the NeHe tut on quadrics if you want to know more. We also have a function Reset() for when we want to return the ball to the start position whenever a goal is scored or a new game starts. The Update() function will use the speed vector to update the ball position every game cycle. We will implement this later, and for now just get the ball to appear on screen. The Draw() function will need to set the color a little differently for the ball since it is a 3D object. A simple call to set the material attributes in OpenGL does this. * We’ll assume the width runs along X-axis and height along the Y-axis. These are just rectangles that we can position at the top and bottom of the board. We will use these to bounce the ball off when we do some collision detection. We add lines to the Game_Init() function that position the walls and as with the other objects we need to draw we add a Draw() command to the rendering section. :Paddles aren’t much different from wall, except we will give them a movement speed and a player score. We also initialise their positions in Game_Init(). The Reset() function will be called when a new game starts, it will just reset the player's score back to zero. Since the wall and goal are so similar, we can use a wall object to represent the goal. We don't need to see the goal so we'll just leave out the command for drawing it. When checking we have positioned the goal in the right spot we can just do a call to the Draw() function and see it on screen. Note: The objects share a lot of attributes which we could use to make an abstract base class to derive them from, but since this is a beginners project and there’s not too many objects we shall leave it be. If you don’t know what I mean, don’t worry it’s just a more advanced OO technique that can be learnt later. Looks like we have all the basic bits and pieces on the screen. I hope you don’t think it was very hard, the next section will get the game actually doing something. The paddle movement is going to require input from the keyboard. We will use the keys ‘A’ and ‘Z’ for player 1 and the up and down cursors for player 2. To check if a key is pressed with this code framework is pretty easy. We just need to check each key using the function KEY_DOWN() in the Game_Main() loop. For the ‘A’ key we just check KEY_DOWN(DIK_A). Okay, it's not too good if the paddles can fly off the screen so we'll be adding some collision detection with the walls to stop that. To detect the collision we check if the edge of the paddle will move past the edge of the wall. When this happens we'll have to let the computer know what we'll want to happen, which in this case, the paddle stops next to the wall. When the collision occurs, we set the Paddle.y position to that edge of the wall. This is done every game loop for both player1 and 2 in the collision section of Game_Main(). The most complex object of the game is the ball. As we mentioned before, the ball has a vector which tells us direction the ball is travelling. If you don't know about vectors, a basic physics/science book will go into depth explaining it. The vector contains information describing how far to move on each axis. For example: A vector where xi = 1 and yi = -2, would mean we would move 1 unit right on the x-axis and 2 units down on the y-axis. So having a vector for a ball, we can easily make the ball go whatever direction we want just by changing the values of each component. We will update the ball's current position every game loop in Game_Main() by calling the Update() function in the ball class. Making these changes to the code we can now see the ball fly straight off the screen. Looks like we'll need to add some collision detection, that's next! Testing for this type of collision is exactly the same as we did for the paddles. The only difference is when the collision occurs we want the ball to bounce off and go the other direction. To make the ball go in the opposite direction the y vector component is just inverted. Therefore if we are travelling towards the top wall yi is positive, to go down we make it negative. The bottom wall is the same. This line acheives it for both scenarios. More collisions! If you mastered the last section this collision isn't much different. Instead of working with ball.yi we work on ball.xi. We only need to check the front edge of the paddle (we can do the side edges of the paddle but it's not crucial). We have to have an extra check in this collision. First we have the same as the wall only on the x-axis, then we have to check ball's y position is in position to hit the paddle. It looks tough, but it is just the same as the other collisions with an extra check. Checking if a goal is scored should be easy if you've been following. The question is what do we do when a goal is scored? First the player who scored needs to gain a point, we just add 1 to their score attribute. Secondly the ball needs to be reset and the player's should be given a little time to get ready. This is where our gameState variable will come in handy. We'll set it to GETREADY that was defined earlier for this purpose. So we can test when to change from GETREADY back to PLAYING we need to use a timer which will be handled with a new global name gameStateTimer. The system function timeGetTime() is used to set it to the current time in milliseconds and add a delay for the time when we change states. 2000 milliseconds (2 seconds) for the delay should be fine. When the game state is GETREADY I've displayed some text so the player's know what's going on. In Game_Main() we check for the game state being GETREADY and test whether it is time to change back to PLAYING by comparing the timer with the current time. Okay this is the home stretch. You will have a complete game after this! There are a few loose ends that need to be tidied up. First, we'll display the player's score in the top corners, a few lines in the text output section of Game_Main() and we're in buisness. We will also check if the GAMEOVER condition occurs. When either of the player's score 7 points we'll end it. Then, we'll make the game state start with GAMEOVER when we initialize the game and display "GAME OVER" the same as was done for "GET READY!". Also we'll allow a new game to be started when we are in the GAMEOVER state and the space bar is pressed. We need to reset the player scores here, and change the game state to GETREADY. Letting the players know the keys is a good idea when the game is in GAMEOVER state. This is the end of the tutorial i hoped you all like it below is the full source code and game. if you our anyone else needs help with this please dont hesitate to ask me thankyou all for reading this tutorial. this is not a lie its the truth hope to see you all try and figure it out. You had one code block in a single line and probably that could be. By the way very nice article. i really appreciate that alot. Do you know any site for online tutorial of game programming. Hey, I heard about iPhone Game Programming – Tutorial, it helps to cover basics of taking an OpenGL ES Application template available in Xcode and making the changes necessary so that we can use it for writing out game. I hope u will help me to download this game. Hello' This Mr devid. i am new here. Well this is my website. please feedback my website. Thanks.